A recent rollover car accident in Salem on Interstate 93 near Exit 1 seriously injured one of the vehicle’s passenger, according to Stephane Cattin, the Salem Fire Captain. The passenger was transported to a Boston hospital. Reports indicate that the accident was called in to authorities shortly before midnight. A pickup truck allegedly slammed into the median’s guardrail, flipped over a number of times and landed right-side up in the median. There was “tremendous” damage to the truck, according to the Salem Patch. There were three people in the vehicle at the time of the accident, one was ejected and one was pinned inside the vehicle. “It required an extensive extrication of about 25 to 30 minutes to remove the passenger,” said Cattin. Our Massachusetts car accident attorneys understand how severe interstate accidents can be. All three of the vehicle’s occupants were taken to Lawrence General Hospital. The occupant who was entrapped was later taken to a Boston hospital. State Police are currently handling the investigation. As we’ve previously discussed, driving along our state’s interstate roadways can be risky. 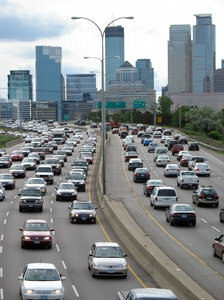 Drivers who aren’t from the area may find it almost impossible to navigate our busy roadways. Even longtime residents find the roads confusing at times. Say you want to get from Gloucester to Taunton. You’d have to get on Interstate 95, which will later converge with 128. At that point, the exit numbers change from 1-30 to 44 and down. After you circle Boston, the exits change again. In the end, you’d have to navigate through three different sets of numbers of three very busy roadways. And that’s just one route in Massachusetts. There are many similar routes that are just as confusing. For that reason, it’s important for all motorists to be cautious when traveling on our state’s busy roadways. There are a few simple safety tips that you can follow to help reduce the risks of an interstate accident. -Getting On. Make sure you’re meeting the on-ramp’s speed limit, which is usually 45 miles per hour. Remember that this ramp is taking you to the interstate, meaning that the speed will increase on that interstate. Speed up. -Changing Lanes. Make sure to check your mirrors and physically look in your blind spots to make sure that no one is in your way. Never cut off another driver. Use a blinker to warn other drivers of your intended maneuvers. Once you’re in your desired lane, shut off your blinker and maintain the road’s speed limit. -Speeding. Don’t do it! Regardless of how fast or slow vehicles may be traveling around you, it’s important to follow the road’s speed limit. -Passing. Make sure that no one is in the lane you need to enter, much like how you do when you’re changing lanes. Activate your blinker and change lanes when the time is right. Pass the vehicle without speeding erratically. Once you’ve passed the vehicle and you can see their entire car in your rear-view mirror, get back into the lane. Never cut a driver off when passing them. -Getting Off. Make sure you know when your exit is approaching. Get in the right-hand lane as soon as possible. Don’t wait until the last minute and shoot over to your exit. Put on your blinker to let other drivers know where you’re going to go. Once you’re on the off-ramp, slow down. Speed limits reduce dramatically once you’re off the interstate. If you or someone in your family has been injured or killed in a car accident in Boston or elsewhere in the state of Massachusetts, contact Boston Injury Attorney Jeffrey S. Glassman. Our firm offers free and confidential appointments to discuss your case. Call 1-888-367-2900.